Mahaprabhu’s seniors, His parents and gurus, are all His servants and eternal associates and they take their birth prior to His appearance in order to serve Him in their own way. Whenever Krishna descends to the earth, He first sends down His elders. These include His father, mother, guru and all the other persons He considers to be the objects of His respect. He arranges that these persons should take birth before He does. Madhavendra Puri, Isvara Puri, Sachi and Jagannath, Advaita Acharya, are amongst those who appeared in this way. Whenever the son of the king of Vraja decides to appear on earth in order to fulfill a particular desire, then He first sends down His seniors. I will briefly name some of them as it is not possible to so extensively: Sachi, Jagannath, Madhava Puri, Keshava Bharati, Isvara Puri, Advaita Acharya, Srivasa Pandit, Acharyaratna, Pundarika Vidyanidhi, Hari Das Thakur, resident of Sylhet named Upendra Mishra. All of them are scholarly Vaishnava, rich and possessed of saintly qualities. Brahma, the master of this universe, was the disciple of the Lord of the spiritual world. His disciple was Narada and Vyasa became the disciple of Narada. Suka became the disciple of Vyasa through the awakening of spiritual knowledge from him. Madhvacharya took initiation in the Krishna mantra from Vyasa. His disciple was Padmanabhacarya, whose disciple was Narahari, who was followed by Madhava Dvija. Akshobhya was his disciple, then Jayatirtha, Jnanasindhu, Mahanidhi, Vidyanidhi and Rajendra followed. Jayadharma Muni was one of Rajendra’s many disciples and Vishnu Puri, the author of Bhakti-ratnavali and Purushottam, the lover of Brahmin culture became his disciples. Vyasa Tirtha, the author of Vishnu-samhita was the disciple of Purushottam. Lakshmipati Tirtha, a reservoir of devotion, was the disciple of Vyasa Tirtha. Madhavendra Puri was the disciple of Lakshmipati, and it is by him that this religion was founded. His disciple, the sannyasi Isvara Puri, took up the mood of conjugal devotion, while Advaita Acharya [also the disciple of Madhavendra] took up the moods of servitude and friendship. Gaura accepted Isvara Puri as His guru, and then flooded the material and spiritual worlds [with love]. Thus, Madhavendra Puri was the disciple of Lakshmipati Tirtha. Madhavendra Puri’s disciples included Isvara Puri, Advaita Acharya, Paramananda Puri (a Brahmin from the Tirhut area), Brahmananda Puri, Sri Ranga Puri, Pundarika Vidyanidhi, Raghupati Upadhyaya, etc. Nityananda is said by some to be Madhavendra Puri’s disciple, others say that Lakshmipati was his guru, while in the Premavilasa, it is said that he too was Isvara Puri’s disciple. As Nityananda Prabhu was wandering (through Southern India) in this way, he suddenly encountered Madhavendra Puri. Madhavendra was the embodiment of love, as were all his associates. He consumed nothing other than Krishna rasa, and Krishna dwelt in his body. 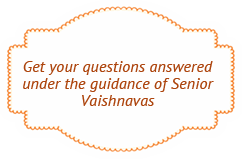 How can I sufficiently glorify him whose disciple was Advaita Acharya? When Nityananda saw Madhavendra Puri, he fainted and became motionless with love. As soon as Madhava Puri saw Nityananda, he too fell down in a faint, completely forgetting himself. No wonder Gauranga repeatedly said that Madhavendra Puri was the harbinger of the ecstatic mood of devotion. First bathe the deity with milk poured from a conch shell, then with yogurt, clarified butter, honey and then sugar, one after the other. At that very moment, the servants of Gopinath started to offer the amrta-keli to their deity. Madhavendra thought that if he could just get a taste of this preparation, he would be able to one day make it himself and offer it to his own Gopal. However, this very thought shamed him, as it is improper to desire the food intended for the Lord. After watching the arati ceremony, Madhavendra went outside and sat in the empty marketplace, chanting the Holy Names. Madhavendra followed the ayacaka-vrtti, which means that he would never ask for food from anyone, only accepting what was offered him spontaneously. He was able to do this because he never felt hunger or thirst, as he was constantly engaged in drinking the nectar of prema and that kept him satisfied. Bhaktisiddhanta Saraswati Srila Prabhupada comments on this incident in his Anubhsaya, “Even though Ramachandra Puri saw his own guru suffering of separation from Krishna, he was incapable of recognizing the transcendental nature of this transport of emotions. He judged his guru to be an ordinary man and took his mood to be mundane, the result of some material insufficiency. As a result he tried to explain to him the value of experiencing the oneness of Brahman. Madhavendra Puri reacted to his disciple’s stupidity and disregard for his instructions and thus stopped wishing for his well-being. He abandoned him and drove him away.” The words “material desires” (vasana) means “the desire for dry knowledge” and from that arose the tendency to criticize the devotees. On the other hand, Ishvara Puri not only adhered to his guru’s teaching but served him physically and thus received his mercy. He served the lotus feet of his spiritual master, even to the point of personally cleaning his urine and feces, as well as helping him to remember Krishna’s name and pastimes. In this way he satisfied him completely. Madhavendra Puri was so pleased with Ishvara Puri that he embraced him and blessed him, saying, “May you have the wealth of love for Krishna!” From that time onward, Ishvara Puri became an ocean of love for Krishna, while Ramachandra Puri became a mine of insults. These two personalities thus became witness to the results of pleasing or displeasing a great soul. Madhavendra Puri taught this truth through them. Madhavendra Puri’s disappearance day is the sukla Dvadasi of the month of Phalgun.